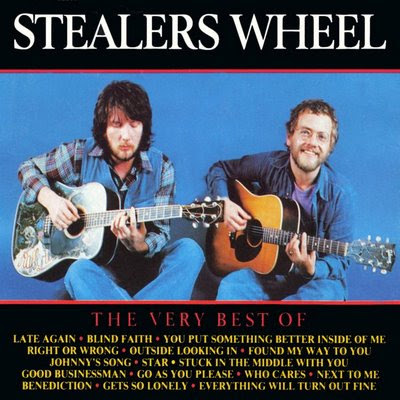 Stealer's Wheel was formed by two Scottish folk singers Gerry Rafferty and Joe Egan, who had previously sung harmonies on Rafferty's 1971 solo album Can I Have My Money Back? Rafferty incidentally, had earlier played in Humblebums. Brown, Noakes and Campbell all left the band before any recordings were made. Rafferty and Egan then put together line-up (C), which included Paul Pilnick (once of The Big Three and later Badger). The band's debut album was full of strong harmonies and was well received. Three of the Rafferty/Egan compositions on the album were issued as 45s and gradually one of them Stuck In The Middle With You, wound its way into the Top Ten. It also got to No 6 in the US. Ironically by then, though, Rafferty had left the band and Williams had been given the push. Harper and Grosvenor (later Ariel Bender in Mott The Hoople) were brought in to replace them, but when the song achieved commercial success Rafferty rejoined the band and everyone else (except Egan) was ousted. Rafferty and Egan recorded Ferguslie Park (which was named after a district of their home town in Scotland, Paisley) with assistance from various session musicians. Like their debut this album was also produced by Leiber and Stoller and again it was full of strong harmonies. Unlike its predecessor it didn't produce a major hit though there were a couple of minor ones - Everything Will Turn Out Fine (also No 49 in the US) and Star (No 29 in US). Favouring a change of approach Rafferty and Egan started working with a new producer, Mentor Williams. However, a series of problems with backing musicians meant the duo couldn't make live appearances for some months and by the time their next album, Right Or Wrong, was released they didn't have much of an audience to receive it and in any case interpersonal relationships between Rafferty and Egan had reached an all time low. When the band split Rafferty embarked on a successful solo career.